For years now, I’ve looked on as my peers have had this obscene fascination with monkeys. I’ve never understood it. I’ve watched them buy monkey figure after monkey figure – I’ve even bought a few myself. I wasn’t usually impressed, but then again none of them were lemon-lime monkeys. Gygor is representative of something I really like about MOTU Classics. I want a lot of things out of this line. It’s a tall order – I want figures from every corner of MOTU – all the cartoons, mini-comics, foreign repaints, whatever. That includes the concept stuff. While I happily await certain childhood favorites or modern takes finally realized in figure form, I love that Mattel is choosing to mine the concept figures to expand the line. I’m excited about Vikor. I’m curious to see Demo-Man. I can’t tell you enough how much I want that concept Horde Mummy to be given figure form. Gygor gives me hope that those wants can be realized. After all, a year ago, he was nothing more than an quarter-of-century old, unused prototype. And look at him now. He’s hit the big time. As the first MOTU monkey, Gygor is an entirely new sculpt, though we already know he’ll be seeing some reuse as January’s Shadow Beast. And while some fans might’ve thought that Gygor borrowed parts from DCUC2’s Grodd, that’s simply not the case. MOTU Classics figures and DC Classics C&C’s are sculpted 1:1. As the Four Horsemen themselves noted, any similarity is simply due to their both being gorillas. As a well-sculpted monkey, Gygor’s got all the right details. There’s obviously the full-body compliment of sculpted fur, but the exposed areas have plenty of detail too. I didn’t get a picture of it, but if you pick up Gygor, check out the bottom of his feet. This guy can leave some nice Bigfoot prints on Eternia (of course they might ask, “what’s China” when they study them). For me, the most impressive part of Gygor’s sculpt is his size. This guy is nearly 10″ tall! I knew he was big, but I wasn’t expecting it. Sil came home after work today and saw Gygor sitting in his package (hey, I was busy today) and was surprised by his size. When Vault saw the picture below, he didn’t believe it. Gygor is huge. Makes me feel a little better about that $30 price tag. One part that Gygor won’t be sharing with the Shadow Beasts is his screaming monkey head. I’ve noted in the past that I’m not a fan of screaming heads even though I feel conflicted about the 4H having to sculpt all these neutral expressions. It’s a waste of their talents. In the end, I like Gygor’s head sculpt – it’s very dynamic and a great homage to the original Big Jim toy, but I wonder if they could’ve done an articulated jaw here so we could get the best of both worlds. I know it would “cut up the beautiful 4H sculpt” and that the upper jaw would have to be done differently, but I know the 4H could’ve worked it out. I was playing with my Royal Guardsman Mynothecean during the Carnivus shoot and that mouth articulation makes him feel like two separate figures sometimes. Gygor can scream to his heart’s content on my shelves, but I’ll always wonder what he does in the time he’s not raging. Another great review and your captions are killer, as always. I, too, am slightly disappointed at the limited articulation. While, yeah, there’s more than Tytus (comparitively), that’s not difficult to do. Still, he does look awesome and I have already made a spot for him on my shelf, in my “Great Unrest” section alongside Count Marzo, Keldor and Kronis. I need Oo-Lar, Captain Randor and King Miro now! Thanks! He looks fantastic, if he could lean forward on his knuckles, I’d be completely happy with him! I’m kinda excited for Oo-Lar, but they need to do something really cool with him to make him worthwhile. I have a feeling Oo-Lar will be a nice mixture of Jungle Attack He-Man and the He-Man first seen in the original mini-comics. That would be pretty cool with me! Etern-net. I think I woke my kids up I was laughing so hard. Great pics all around. I wish Gygor were better. They really knocked Battle Cat out of the park and have yet to follow up on that success thoroughly. We know Panthor will rock, but I wonder what will happen with Swift Wind next year. I don’t really have a dog in the Swift Wind race. They should do both. I don’t know if they could have done anything besides the v-crotch hips. I think Gygor was well worth the $30. The v-crotch is the likeliest solution and I’m not sure what could have been instead that would maintain the aesthetic, I just wish there was a little more to the legs. i’d have loved a waist swivel… and really, did he have to be this soft? he’s soft, his torso is squeezable like a ketchup bottle, the arms feel soft, his head comes off easily… i don’t know, the overall quality feels kind of cheap to me… despite the fact that he looks good. i don’t know about you guys, but i had to rubber band my axe into his hand too, he could barely hold it upright, and god forbid you PLAY with it and strike another fig, it came right out of his mitt… and after carnivus’ laize faire grip, that’s 2 motucs in a row that can’t properly hold their weapons… kind of small complaints, but totally valid at this price point. The softness of the figure is to reduce costs of shipping and plastic use. Yeah, no looseness on his axe. A waist swivel could have been good, easily hidden by the belt line. And I didn’t squeeze his tummy until you suggested it. Kinda odd. but back to the original point, if i was just displaying him, like on my night stand next to my bed when i sleep (don’t judge me) he holds the axe just fine for those purposes. it’s only when you use him as intended that he has issues. Pretty much feel the same way about this guy. He’s cool, I’m just not overly impressed. This thing of “it’s a new sculpt” argument by the 4H/Mattel when it clearly isn’t is really getting boring. Derivitive sculpt maybe. But, like Tytus, they added some new details, some armor, new accessories, and then digi-scanned-printed/pantographed/hydrospanned (whatever) to make him larger. But GyGor is based on Gorilla Grodd’s sculpt undeniably. I guess all custom figures peoples make are brand new scupts then too. Top notch review per usual Noisy! I got better monkey toy than Gygor wat you got.I have…..King Kong the 8th wonder of the world made by Playmates. I’ll have to look up a Playmates King Kong. Never really paid attention. I did have the McFarlane Kong but sold it sometime back. That was a good monkey figure. Great review. My Gygor has been going helmetless too. Great sculpt. I love that head sculpt and it looks even better uncovered. I was overall happy with the figure. I almost didn’t get it, not because I wasn’t interested in it, it was because I was frustrated with the White Screen of Fail. My patience just about had it and I gave up on it. After calming down, I finally got through and ordered it. Do I think it was the best figure out of the MOTUC line that month? No. Carnivus took that title. Gygor was an “ok” choice but only because I wanted a balance against Tytus, at the moment. I forget Tytus’s rival, but I think that’s who I’d want soon… and would have preferred him over Gygor as he’s still a little too short against Tytus. One thing I’ve learned is that the Bad Guy should be bigger than the good so as to have the good have a feeling of accomplishment when defeating the bad. You don’t get that with this line. You get the “Oh, that Skeletor… naughty boy” scenario… But then again… Mattel’s marketing wouldn’t know that cos they aren’t actually in the entertainment industry. The WSOD was awful, I anxiously await my all-in sub kicking in (though the Palace Guards will now be a 2011 b ane). Megator didn’t make the cut for 2011. Shadow Beast, Swift Wind, and Panthor will be the three beasts next year. I imagine he’ll have to be in 2011 though – hopefully with a new buck. Noisy, thank you for continuing to rep the 7th Kingdom HARD. I agree completely about the permanently expressive head. I don’t have mine yet, and I will admit that the head sculpt was still enough to sell me on it, but I do think a moving lower jaw would have been better. If it required the Horsemen to move to more of a baboon or mandrill head to accommodate it, I’d have been good with that too. lol like that infamous Tarzan toy? I’m not the biggest animal toy lover, but the 7K/FanEx stuff are still undeniably awesome toys. i keep imagining using the oozaru breath weapon… that helps. At first I wasn’t sold on this figure but once I received him yesterday “WOW”! Man he’s husky & heavy. I really dig the design the FH did on him. I’m glad I purchased 2 of him last week on Matty. 2 thumbs up on him!!! Oh love new review by the way–Tytus finally has a battle weapon….. Thanks! 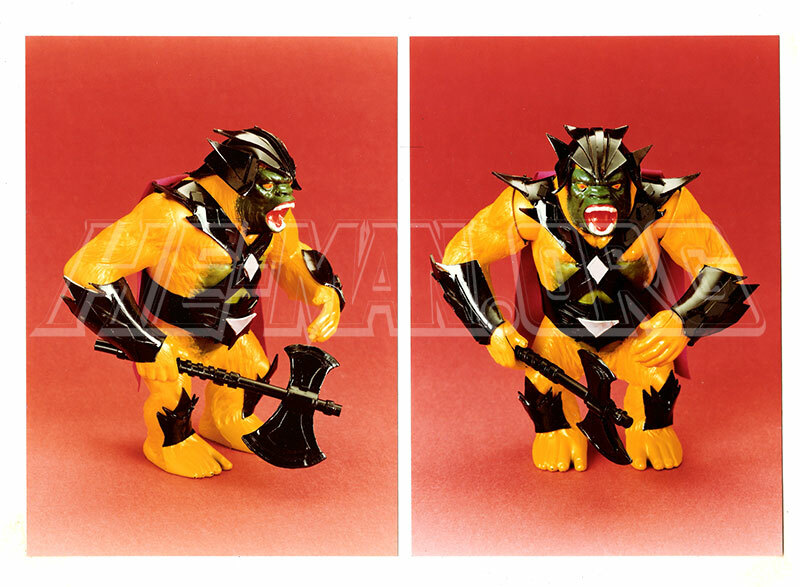 I’m kinda jealous – I’d be happy to customize a second Gygor into a good gorilla counterpart. Hi! I’m a long time reader, first-time poster, and MOTU collector since 1982. I love the site as a whole and the reviews in particular. They’re excellent and carry all the right information. The pictures are crisp and detailed, the comparison shots are great, and the comics are invariably funny. Looking forward to your next review with great anticipation. Keep up the sterling work! I am disappointed by his in ability to stand gorilla-style. That’s my major peeve about the figure, otherwise (and yes, cavities included) I think he’s a good buy. ROFL, that thing is so funny. I have to share that.